Women artisans in India string beads wrapped in repurposed textiles to create a stand-out accessory. 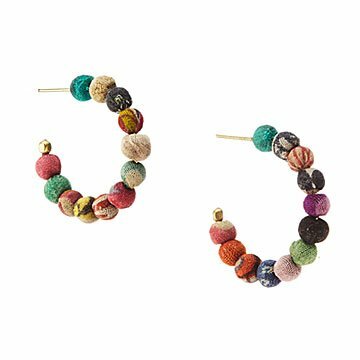 Colorful as candy, these hoops are equal parts sophisticated and sweet. Women artisans in India string together vibrant kantha beads—beads wrapped in repurposed textiles—for a stand-out accessory that adds a pop of color to a classic white tee and jeans. Handmade in India. Kantha beads are made from repurposed textiles, so each pair is one-of-a-kind. Not quite as bright as depicted in picture but still quite pretty. Very versatile for many occasions. Wear them during the day, several days a week, and they are just right. I would have preferred that they fasten on with fish hooks, but they work as they are.